What if you were only allowed 2.5 real estate transactions a year? You okay with that? That would be the reality if all transactions were shared equally. According to NAR, there were approximately 5 million homes sold in 2015. That may sound like a lot, but when you consider that NAR also states there are a whopping 2 million agents with their hands in the cookie jar. You may be thinking, "but most of those are part-timers." You are absolutely right. There are a lot of part-time agents. But you don't have to walk far to find an agent that lost out on an opportunity because someone listed with their friend/neighbor/aunt/dog groomer's best friend that is very part-time. Regardless of whether they are full-time agents, part-time agents, or just have a license to help with their real estate investing business, there are a lot of licensed real estate agents. With so much competition, its important that you separate yourself as the go-to expert for real estate in your area or niche. 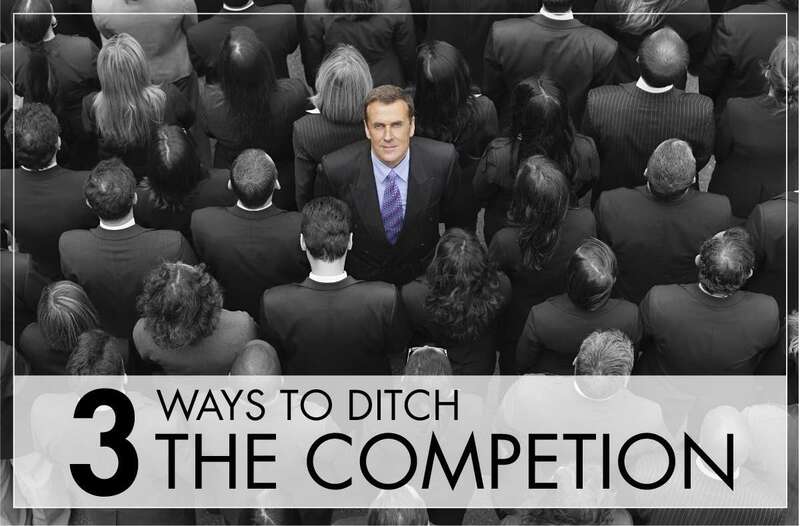 Here are 3 strategies you can use to separate yourself from the competition. The reality is that each homeowner has feelings of concern, excitement, fear, and anxiety, sometimes all at once, during the process of selling their home. Many agents fail to recognize what the homeowner is feeling and just focus on getting the listing. Whenever this happens, most homeowners put up a huge wall, so to speak. It’s important that you realize that the lead you are working is a fellow human, not a transaction. Now that may sound obvious, but most clients feel more like a transaction and less a fellow human when being called by a real estate agent. When you call a FSBO or Expired, are you talking to them about listing their home or are you talking about their needs and wants? Most agents say something like "I can sell your home for the most amount of money in the shortest time." That approach is treating the homeowner like a transaction, not a human. When you call, ask them questions to learn about why they decided to sell, where they plan on moving, and what concerns they have. Be empathetic and personal. Share stories or bring humor into the conversation. When the time is right, help them solve their problems. Humans want to feel like humans. By treating them as such, and not merely a transaction, you are going to build trust and set yourself apart from other agents that are just trying to list a home. One of our most popular articles is about how providing value could be your #1 strategy to attract FSBOs. This principle holds true for any type of lead. The idea is to show them that you are the expert rather than telling them you are the expert. It’s a very simple thing to do, but most agents refuse to do it. "I'm an expert. I'm not just going to help them for free," said one agent in a forum. Consider your own buying habits. When was the last time you bought a car without test driving it? Are you more likely to buy the software that comes with a free trial or the one without a free trial? Everyone is more likely to purchase something when they have confidence the value it provides is equal to or greater than the cost. Buying or selling a home is the largest transaction in most people's life. Why would anyone want to use an agent without knowing the type of value they can provide? Provide details of nearby homes that recently sold. Not just selling prices, but details that show you are an expert in the area, like the days on market, what improvements the homeowners did to help sell the house, or specifics on why the open house was or was not successful. Selling points of the area, such as school test scores and education trends, nearby parks, local crime rates, or the local’s restaurant of choice. Providing value will immediately separate you from other agents in a big way. Lastly, if you want to separate yourself from other agents, prospect different types of leads. Sure, FSBOs and Expireds should be your bread-and-butter, but that doesn't mean you can't find great value in prospecting other leads, too. Some great leads that few agents prospect are probate leads, recently divorced homeowners, and pre-foreclosures. One reason competition is so low is because they are very niche lead sources. Not only can they can take a lot of time and energy, but they can also require a specific skillset and experience. If you have experience or know someone that can help you gain the experience, these can be a very profitable lead source with very little competition. I saw you had a home on the market [time period] and it looks like it didn't sell. Is that correct? I was wondering when you were considering putting it back on the market? Scrubbing out the homes that eventually sold or are currently active can be extremely time consuming and one of the deterrents from agents calling old expired leads. Not only does Landvoice scrub and filter these leads for you, but you can also get exclusive access to any year and zip code combination (example, 2012 for ZIP 84663) for an entire year. Old expireds, and other niche lead sources, are a great way to ditch the competition. If you find yourself losing listings to other agents in the area, focus on the way you communicate and build relationships. Make sure you are speaking to people’s concerns and needs, rather than getting a listing for yourself. Always provide as much value as possible. Never withhold your expert knowledge and experience. If you do these things, along with prospecting leads with low competition, you will have a strong and healthy real estate business year-round.